Scarce French and Indian War Era Map showing Fort Dequesne. This is an uncommon and detailed 1763 Italian issue map of the Great Lakes and adjacent territories. The map covers all five of the Great Lakes although Lake Superior is only partially represented. 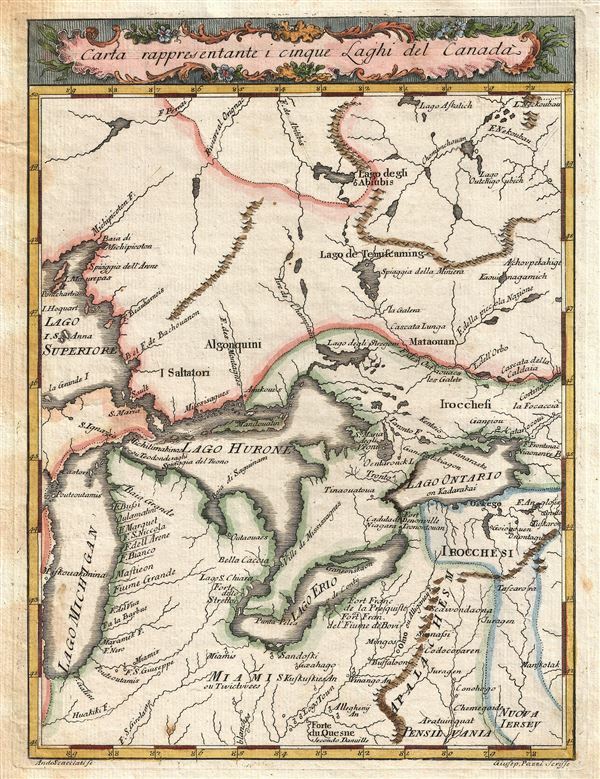 It extends northwards well beyond Lake Superior, southwards as far as Fort Dequesne (Fort Pitt, Forks of the Ohio), westwards to Green Bay, and eastwards to include parts of New Jersey. The map identifies geographical features, various rivers, trading post, and fortifications. American Indian tribes are identified with curious Italianized names such as the 'Irocchesi' and 'Algonquini.' The site of Niagara Falls is identified. This map was issued at the close of the French and Indian War. The cartographers seem to have drawn primarily from French sources published during and before the war, hence the identification of Fort DuQuesne, which by this time has been renamed Fort Pitt (Pittsburgh, PA). Another reference to French sources appears in Lake Superior, where two of Count Charlevoix and Nicholas Bellin's fictional islands: I. S. Anna (referencing the count's patron saint) and Pontchartrain (named after the family seat of Charlevoix' s patron, Jean-Frederic Phelypeaux). The borders here defined suggest French dominion extends eastwards beyond the Apalachian Mountains into Pennsylvania - most of this territory was lost to the French during in the 1763 Treaty of Paris which formally ended the war. The borders of the lands claimed by the Hudson Bay Company, although not labeled as such, appear to the north. This map was engraved by Andrea Scacciati and Giuseppe Pazzi for the 1763 Livorno issue of Il Gazzettiere Americano. Kershaw, K. A., Early Printed Maps of Canada, no. 969.